Cherry Wood is a sweet, mild flavor, good for wild game, poultry, and shellfish. 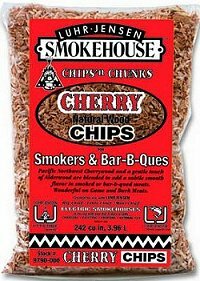 Smokehouse brand Wood Chips N Chunks are thoroughly dried and all of the bitter tree bark has been removed to ensure 100% natural wood and maximum wood smoke. The wood chips are precision ground for an even, consistent burn. 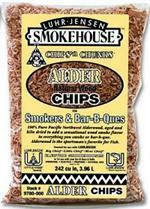 Chips N Chunks work in electric and propane food smokers, Grills, and Bar B Ques. 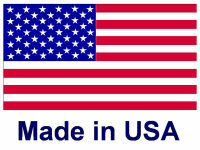 Smokehouse Products is located in the beautiful Hood River Valley in the heart of The Columbia River Gorge. The Little Chief electric smoker was introduced in 1968 (under the Luhr Jensen brand) and enjoyed such success that the Mini Chief and Big Chief smokers soon followed. Today Smokehouse Products offers a full line of smoker accessories, including five flavors of chips and chunks, sausage making kits, sausage mixes, seasonings, jerky and dry rub mixes, drying screens, smoker insulation blankets, and replacement parts. Smokehouse Products is committed to supplying our customers with the very best smoker accessories on the market today and will continue to look for ways to enhance your experience using the Big Chief, Little Chief, and Mini Chief smokers. Older Smokers may carry the Luhr Jensen or Totem brand, instead of the current Smokehouse Products logo.